Product categories of Pipe Bend, we are specialized manufacturers from China, Welded Pipe Bend, Steel Pipe Bend suppliers/factory, wholesale high-quality products of Pressed Pipe Bend R & D and manufacturing, we have the perfect after-sales service and technical support. Look forward to your cooperation! 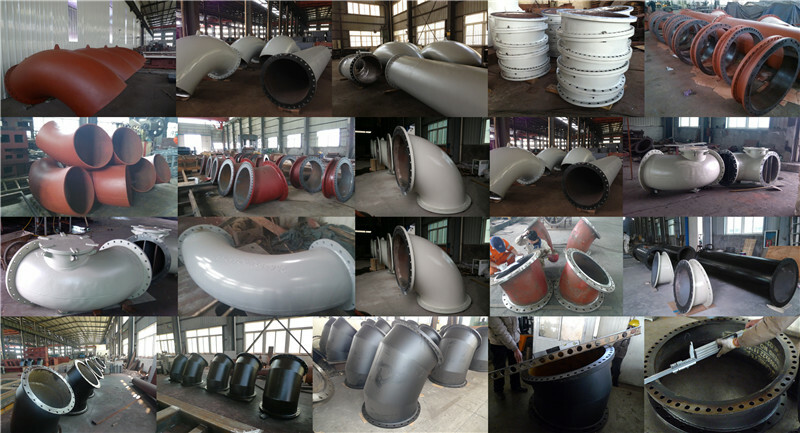 Welding elbow production process, if the long radius of the elbow, you must first select specifications, put forward the tube material. Spread ratio, through theoretical calculation, the general expansion rate of 35% - 33%, and push back. Short radius 219mm general expanding diameter rate of 50%. Selected raw materials, in material according to the specifications of the elbow, then consider the radius of curvature, for example, 90 degree elbow, by its curvature can figure out how many materials can be processed with 90 DEG elbow. It can be calculated by theoretical calculation, and then cut off with the length of the length. Finally, the material pushing system. You may have seen the machine, the actual is very simple. It is a horn shaped mandrel or mandrel, the mandrel is changed from thin to thick, push the process is a process of expanding with bending. Behind a support pipe section to penetrate mandrel material, one behind the arch frame will be fixed mandrel. Hot bend forming process is the special Elbow push processing machine, a core mold and a heating device, which makes in the mold blank in pushing mechanism driven by forward motion and in the movement is heating, expanding diameter and bending forming process. The deformation characteristics of the hot pushing elbow is based on the metal plastic deformation before and after constant volume law to determine the tube diameter, the tube diameter less than the diameter of the elbow, the through mandrel control the blank deformation process, the arc by the compression of the metal flow, compensation for expanding and other parts of the thin, in order to get uniform wall thickness of elbow. The hot pushing elbow forming process has the advantages of beautiful appearance, uniform thickness and continuous operation, suitable for mass production. Therefore, it becomes the main processing method of carbon steel, alloy steel elbow, and is also used in some specifications of stainless steel elbow forming. The heating method of forming process has the intermediate frequency or high-frequency induction heating (the heating coil can be multi circle or single ring), the flame heating and the reflection furnace heating. Products have special requirements are still in use. The stamping of the elbow is formed by using the tube blank equal to the outside diameter of the elbow. Before stamping, the tube blank is placed on the lower die, and the inner core and the end mould are filled in the tube blank, and the upper die downward movement begins to press down. Stamping elbow points cold stamping and hot stamping two kinds, usually based on the properties of materials and equipment selection of cold stamping or hot stamping. Cold extrusion bend forming process is the use of special elbow forming machine, tube into the outer mold, mold clamping, under the push of tube billet reservation along the inner mould and the outer mould gap of movement and forming process.